Casa Helena is situated in Costa Vicentina Natural Park. This rustic 2 bedroom cottage is an annex to an English speaking family home. Offering tranquillity and relaxation, the private pool is set in mature gardens where you can lay back and listen to the swaying palms. WIFI is available. 5km away is Monte Clerigo a great family beach with 2 great restaurants and several cafes or a 10 min drive takes you to Arrifana a surfers paradise. The market town of Aljezur is 8km drive with it's 10th century hilltop moorish castle offering spectacular views and a variety of shops, cafes and bars. Located in the National park this is the perfect spot for bird watching, rambling other activities available nearby are horse riding, fishing and tennis. Lounge/dining area with satellite TV, stereo, table and chairs. The kitchen includes cooker, hob, fridge, washing machine, microwave, toaster, kettle, cooking utensils, cutlery and crockery. Notes on accommodation: Suitable for children. Supervision at all times with children round at the swimming pool. winter heating extra5 euros for 6 hours with electric rads payable on site Set in Mature gardens, the private swimming pool is 8 X 4 metres with a depth of 1-1.8m chairs and loungers provided. The pool is not heated. Table and chairs in the terraced BBQ area. Cleaning / Towels / Linen / Maid service: Bedlinen and towels provided. The cottage is cleaned prior to arrival and on departure. The cottage must be left tidy by guests upon departure or cleaning can be arranged at an extra cost. Beach towels can be hired at 5 euros per person. Other: Iron, ironing board, hairdryer and travel cot available in the cottage. Wifi is also available. 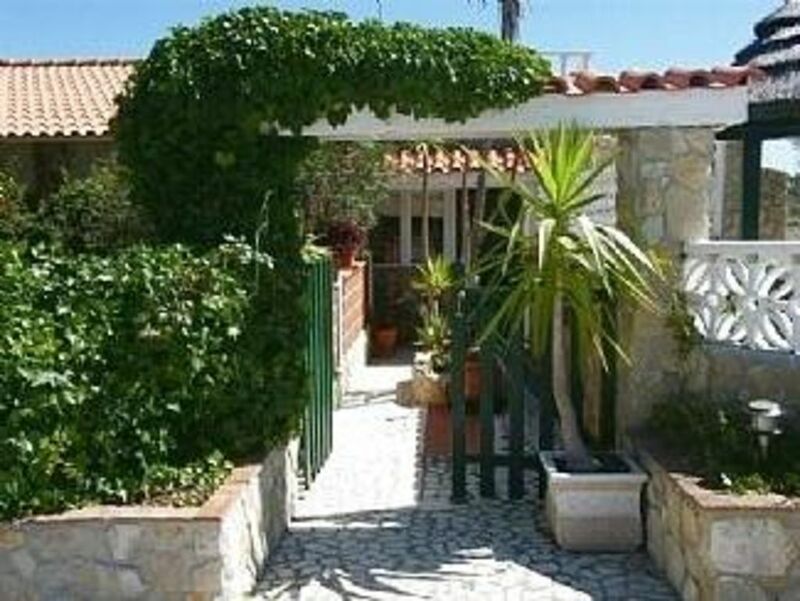 Cosy ,compact 4 bedded villa with delightful pool. reasonably priced. This property is built into a hillside so bedrooms, bathroom and kitchen are on different levels. It is ideally situated to visit this unspoilt region of Portugal. The surfing beaches are close by where you can hire boards/wetsuits and eat well at beach restaurants. We spend five perfect summer days with our familiy in Helens beautiful house near Aljezur. The kids really loved to play in the pool. Around the house are lots of beautiful beaches, but you need a own or rental car... Helen was a really nice host, she lives in the next house. Go there,..
Helen is a fabulous, helpful host and a fount of knowledge about the area. The house is small and cute with a beautiful roof terrace and BBQ area and stunning looking pool- freezing cold in winter but the sea is still warm. Aljezur has a lovely (free) castle with great views, public swimming pool and intermarche supermarket. It is about 10-15mins away. There is a closer little supermarket for everyday essentials and restaurants near by. There are a wide range of beautiful beaches to choose from - our favourite was Praia da Amoireira with its lovely clifftop walk. There are lots of walking trails but you need to bring a good map or ask the locals. We enjoyed walking from the campsite near Aljezur down to the beach and other countryside walks. Silves castle is lovely as is the old town plus a stunning drive via Marmelete -check out the Mirador en route. Slightly vertiginous in places. Lagos' beach, Praia da Ana and the nearby headland have lovely stacks and arches to view as well as fossilised shells. We saw storks, egrets, mongoose, wild junipers, crowberries, strawberry trees and more during our stay. Hope you enjoy it as much as us. Helen is a wonderful host, always helpful. The house itself is small and cozy. Everything is spotless. There are the most beautiful beaches nearby, but you definitely need a car. We absolutely recommend this place! our 3 children and it was absolutely perfect for what we needed. The house and pool are very clean and also really private. Helen herself is a fantastic host and even made us sandwiches for our late arrival. We wouldn't think twice about rebooking if we return to this amazing area. Thanks Helen, we definately plan to be back! are so pleased you enjoyed stay 'CASA HELENA& the surrounding areas ,the beaches are so Wonderful and peaceful. We had a long weekend away (Thursday to Tuesday) for our wedding anniversary. Away from it all, away from the kids! We wanted to relax, rest, surf, read and enjoy the sun. Also the beautiful scenery and delicious Portuguese food and wine. Helen made us feel very welcome. She is friendly and hospitable. As she has been in Portugal 25 years she knows the area so it was good to find out where to go for different things. The cottage is cosy and we really enjoyed staying in it. We enjoyed the pool and barbeque areas too. Arrifana is great for surfing although a little busy at times. Monte Clerigo is very beautiful too. We enjoyed the local restaurant and also one in Arrifana. We found the supermarket fairly pricey so we would suggest going to the nearest Lidl! Activities available nearby are horse riding, fishing and tennis. The are 3 main beaches in the area: Monte Clerigo 5 mins drive great for families with a couple of restaurants and cafes. Arrifana, a 10 min drive, great for surfers and also has a surf school if you would like to learn. Amoeirara. Faro is the nearest airport and is approx 1 hour and 20 mins drive. The market town of Aljezur is 8km drive.